QL Magic » Blog Archive » Like true beauty, QL style never dies! This re-edition has been printed among the cards of the Judge Gift Program enriched by the beloved and charming “old frame”. Crucible of Words was designed by the MTG community in 2003 through the “You Make the Card” voting and included in the Fifth Dawn expansion, but today it has become even more appealing. 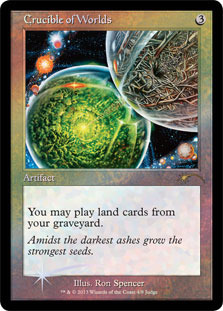 By the way we want to remind you that unfortunately this card is not playable in QLMagic.